The Jordanaires were an American vocal quartet that formed as a gospel group in 1948. They are known for providing background vocals for Elvis Presley, in live appearances and recordings from 1956 to 1972. The group has also worked in the recording studio, on stage, and on television with many other country and rock and roll artists. The history of the Jordanaires can be traced back to the early 1940s, and the original Foggy River Boys, which were made up of the Matthews brothers, all ordained ministers: Bill (b. LaFollette, Tennessee, 1923), Monty (b. Pulaski, Kentucky, 1927), Jack, and Matt. In 1948, Matt and Jack left to become full-time preachers and were replaced by Bob Hubbard (b. Chaffee, Missouri, 1928), also a minister, and bass singer Culley Holt (b. McAlester, Oklahoma, 1925), and pianist Bob Money. After three years Money was replaced as pianist by Gordon Stoker. At that time, they formed the new group as the Melodizing Matthews, in Springfield, Missouri, but soon changed the name to the Jordanaires, after Jordan Creek in Missouri. This starting lineup lasted until 1949; at that time, Bob Hubbard was drafted and was replaced by Hoyt Hawkins. Later that year, Monty and Bill Matthews left. Hawkins switched to baritone, and new lead Neal Matthews was recruited. Don Bruce came in as a new first tenor; however, he was drafted the next year. The group narrowed to a quartet, with Stoker taking over as first tenor. They became members of the Grand Ole Opry in 1949. They recorded for Capitol Records in the early 1950s, and began providing vocal accompaniment behind solo singers in Nashville, Tennessee. The lineup changed again in 1954, with Culley Holt leaving and new bass Hugh Jarrett coming in. The quartet became well known in the southern gospel realm, and what made them stand out from other quartets of that time was how they would bring spirituals (such as "Dry Bones") to a predominantly white audience. While continuing to turn out gospel albums of their own, the group become better known for the signature background harmonies they have provided on dozens of secular records. Jarrett remained until 1958; at that time, he was replaced by Ray Walker. October 3 1954 a teenage Elvis Presley made the drive from Memphis to Nashville to make his one and only performance on the Grand Ole Opry . Debuting his high-energy brand of rockabilly with Blue Moon of Kentucky it was his first live performance on national radio broadcast. He had just recorded his first record at Sun studios. That's All Right just a few weeks prior. 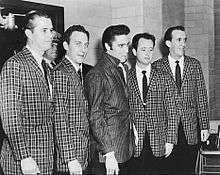 A afternoon in 1955, the Jordanaires played a show in Memphis with Eddy Arnold to publicize their new syndicated TV series, Eddy Arnold Time (for the program the group used the name Gordonaires). They sang "Peace in the Valley", and when the show was over, Elvis Presley, an emerging singer, talked with them and said, "If I ever get a recording contract with a major company, I want you guys to back me up." He was on Sun Records at that time. On January 10, 1956, Presley recorded his first session for RCA with guitarist Scotty Moore, bassist Bill Black, and drummer D. J. Fontana. "I Got a Woman", "Heartbreak Hotel", and "Money Honey" were recorded. Presley asked his new label RCA Victor if the Jordanaires could appear on the recordings. The next day Gordon Stoker was called by Chet Atkins to do a session with a new young singer named Elvis. RCA had also just signed the Speer Family. Atkins asked Stoker to sing with Ben and Brock Speer so he could use them. The recording session for "I'm Counting on You" and "I Was the One" was the first session Presley did with vocal background. By April 1956, "Heartbreak Hotel" was No. 1. After having done several more recording sessions in New York with Moore, Black, and Fontana, Presley flew to Nashville on April 14, 1956, to record "I Want You, I Need You, I Love You". Stoker was called again, to sing a vocal trio with Ben and Brock Speer. After the session, Presley took Stoker aside and told him (not knowing, at the time, why all the Jordanaires were not there) that he had wanted the Jordanaires. This time, Stoker saw to it—and Presley used the quartet on nearly every one of his recording sessions for the next 14 years. The quartet also appeared in some of Presley's movies, and on many of his television appearances. As Presley was about to start performing at the Hilton in Las Vegas, the Colonel's office called for the Jordanaires to work with Presley in the shows. They had 35 recording sessions already booked for the dates he needed, so they could not go. They got in touch with the Imperials, who had done the background vocals for Presley's album How Great Thou Art along with them, and the Imperials took the place of the Jordanaires. The lineup consisting of Gordon Stoker, first tenor and manager, Neal Matthews, second tenor and lead, Hoyt Hawkins, baritone, and Ray Walker, bass, would be the group's most stable lineup, lasting throughout the 1960s and 1970s. In January 1978 the group performed a medley of Presley's songs on the NBC TV special Nashville Remembers Elvis on His Birthday. The group changed again in 1982, when Hoyt Hawkins died. His replacement was Duane West, formerly of Sonny James' backup group, the Southern Gentlemen. In 1990, the group provided backing vocals for Presley's former Sun Records labelmate Johnny Cash on his Mercury Records album Boom Chicka Boom. The lineup remained constant for the rest of the decade, with West leaving due to illness in 1999 (he died on June 23, 2002). His replacement was Louis Nunley, formerly of the Anita Kerr Singers. Neal Matthews died April 21, 2000. He was replaced by new lead Curtis Young. Hugh Jarrett died at 78 on May 31, 2008, from injuries sustained in an auto accident in March. Gordon Stoker died at 88 at his Brentwood, Tennessee, home on March 27, 2013, after a long illness. His son Alan confirmed that the Jordanaires were formally dissolved, per his father's wishes. The Jordanaires have also recorded with Julie Andrews, Johnny Cash, Patsy Cline, Red Foley, Tennessee Ernie Ford, Connie Francis, Johnny Hallyday, Johnny Horton, Ferlin Husky, Waylon Jennings, George Jones, Steve Lawrence and Eydie Gormé, Loretta Lynn, Janis Martin, Ricky Nelson, Willie Nelson, Dolly Parton, Jim Reeves, Kenny Rogers, Sawyer Brown, Ringo Starr, Sister Rosetta Tharpe, Conway Twitty, Tammy Wynette, Faron Young, and others. The group toured extensively around the world and recorded a number of albums on their own. In 1999, a call to tenor Gordon Stoker by Grammy Award-winning artist-producer Art Greenhaw resulted in a run of six Grammy-nominated albums and a Grammy Award. Gospel music pioneer James Blackwood was also responsible for the initial Jordanaires' collaboration on the indie label Greenhaw Records. The years between 1999 and 2006 saw the Jordanaires and Greenhaw artistically joined with The Light Crust Doughboys, Ann-Margret, Engelbert Humperdinck, The Blackwood Brothers Quartet, and Nokie Edwards (of The Ventures), receiving Grammy nominations. In addition, the Jordanaires-Greenhaw Records teaming also received a Dove Award nomination for Best Country Album of the Year for God is Love: The Gospel Sessions with Ann-Margret. The Jordanaires performed with many modern recording artists as well as recent sessions with country music legends. 1973: Bobby Bare's hit single "Ride Me Down Easy"
1988: Appeared in Sawyer Brown's music video "My Baby's Gone"
2006: The Grascals album Long List of Heartaches, on the song "Did You Forget God Today?" 2011: Kristin Chenoweth's Some Lessons Learned, on "What Would Dolly Do"
↑ "Opry Timeline – 1940s". Retrieved July 6, 2012. 1 2 "The Jordanaires". Rovi. 2012. Retrieved July 6, 2012. ↑ "Jordanaires Biography". Retrieved 11 May 2011. ↑ Graham, Charlotte "The Jordanaires" (February 22, 2003), The Clarion-Ledger (Jackson, MS), "Religion," p. 1E. ↑ "Hugh Jarrett". Retrieved March 28, 2013. ↑ Cooper, Peter (March 27, 2013). "Jordanaires leader Gordon Stoker dies". The Tennesseean. Retrieved June 2, 2013. ↑ Lewry, Peter; Goodall, Nigel (1991). Cliff Richard The Complete Recording Sessions 1958-1990. London: Blandford. pp. 62–63. ISBN 0-7137-2242-8. ↑ The Jordanaires at AllMusic. Retrieved July 15, 2013. ↑ Official records, National Academy of Recording Arts & Sciences, 2000–2006. The Jordanaires on YouTube, with Connie Francis, "I Love You Truly"